Ask me my three main priorities and I will tell you, education, education and education. These now famous words are those of the former Prime Minister Tony Blair. Adored in some quarters, hated in others, he did, to his credit invest in education. The ambition of getting 50% of students into university is a good ambition. Not only socially but also economically. In economics, investment such as in a new university is a supply side policy, these aim to increase the productive potential of an economy. These policies will in turn, increase well-paid jobs in Peterborough and make our economic growth sustainable. Callum Robertson with Baroness Scott. The aim of this new “technical university” is to equip people with the skills needed to work in Peterborough and its expanding economy to make the growth work for all. Liberal Democrats have always placed education at the heart of our agenda, we hope to help people not be enslaved by poverty, poor life chances or having the misfortune to be placed in a so called “sink school”. 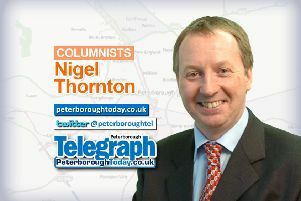 Peterborough has had problems with its education system for a while now and it is abundantly clear that investment in infrastructure, teachers and equipment is needed to help boost not only attainment but, crucially, wellbeing too. So back to the university, the idea of this is to enable local people to gain skills required to by local employers. This will help not just economic growth but the life chances of our citizens. In helping young people gain the necessary skills to grow their own chances we are doing not only our young people a service but also helping ourselves in the long term. For too long, politicians of all creeds and colour have offered one-trick solutions to our problems as a society, whether it be Mr Farage and his unhealthy obsession with Brussels, Mrs Thatcher with her right to buy (a scheme that is great in the short term but has led to a chronic shortage of council housing) or Jeremy Corbyn with his economically illiterate spendathon. The truth with solutions to problems to quote Sir Vince Cable “if it is simple it won’t be effective and if it is effective it won’t be simple”. The risk of increased pressure might be off-putting and in the short term might be disadvantageous, but in order to succeed as a city we must be ambitious, and in order to achieve we must take risks. I am willing to put my neck on the line here and say that this university will pay for itself tenfold and it’s a chance we cannot afford to overlook now.